I’m really enjoying taking ‘selfie’ photos. I’m also enjoying my time with Aaron. We have our ups and downs, but overall we’re really enjoying ourselves. 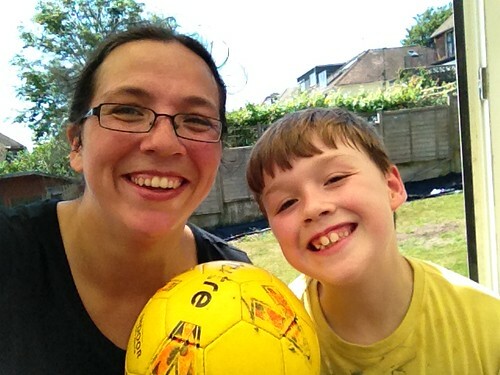 The latest to the edition of selfies is Aaron and I after playing football. This is something I normally leave to him and his dad, but not this time. I wrote something recently about parents being hypocrites and thought it would be best for me to muck in as much as possible. We had fun and both got the exercise we aim to get (everyday for him, 3-4 times per week for me). I’ve asked Aaron to make sure we do the ‘regular exercise thing’ and he’s the best thing out there to pester me into doing it. One of the things I’ve really appreciated is just letting loose and enjoying my time with Aaron. It’s really not something I’ve done enough - and I only realise this now. It’s all good stuff and I it really helps him (generally and behaviour wise) when I take the time to focus and connect with him. Aaron had trouble getting to sleep last night, when he got up in the morning he told me about his wonderful idea that arrived during his inability to get to sleep. The excitement was in his eyes, I could literally see the spark flickering! He’s been learning about Lego Creators and building his own stuff. He’s been creating a few small things - a couch, a dog and a snail for example. This morning he happily said he wanted to build our house in Lego. I full support this idea (! ), I’m actually quite keen to get involved and help him along the way. It’s going to be a bit of a challenge as we have quite a quirky looking house. he’s problem solving - it’s not quite so easy to create specific building features. He’s going inside and out of our house constantly to really observe our house and how he can choose the right Lego pieces to build his model. maths - he’s doing the maths, counting the amount of pieces he needs. Sorting out pieces we have at home and figuring out the budget we may need to make it happen.